Beverly Hills is one of the richest cities in America. It attracts tourists from around the world and is home to many expensive hotels and restaurants. The Governor of California, Arnold Schwarzenegger, and his friend, the actor Sylvester Stallone, have been known to enjoy a cigar on the patio of a local cafe. But such behaviour will be banned from October after Beverly Hills city council voted to create smoke-free areas outside restaurants. People will be able to smoke in sectioned-off areas around hotel swimming pools. Opponents say the ban will prompt smokers to eat in nearby Los Angeles, which still allows people to light up if they're outdoors. But the American Heart Foundation has congratulated Beverly Hills for protecting diners from second-hand smoke. The council says it plans to look at the impact of the new law after three months. 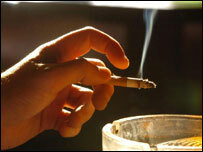 In 1998 California became the first US state to introduce a complete smoking ban inside public buildings.